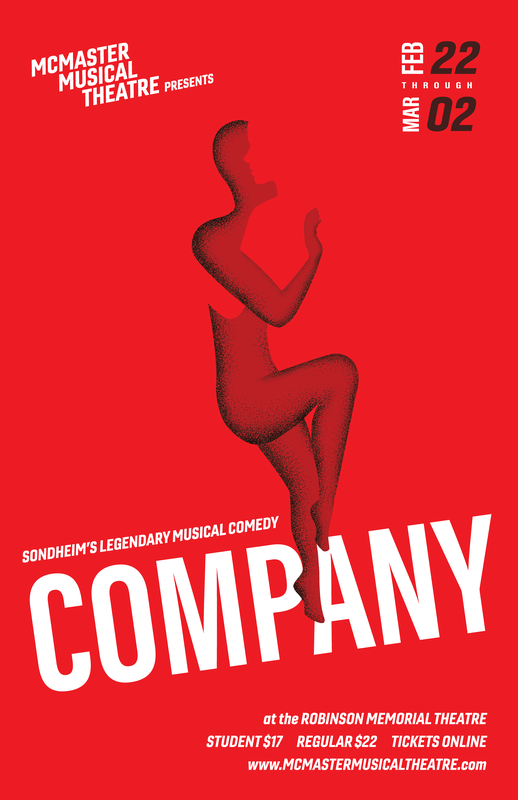 Home Events McMaster Musical Theatre presents "Company"
McMaster Musical Theatre presents "Company"
Join McMaster Musical Theatre (MMT) as we showcase one of Stephen Sondheim’s revolutionary musicals from the 70s, Company! Following the story of Bobby, a single man unable to commit to a steady relationship, Company is a concept musical that takes a critical look at relationship struggles, marriage, and commitment. Set around Bobby’s 35th birthday, the show is presented in short vignettes, offering a glimpse into Bobby’s friendships with his married friends and three girlfriends. All of them want Bobby to settle down, but Bobby is conflicted – can he come to his own conclusion about love and being in a relationship? A revolutionary musical and multi-award winner, Company will make you laugh, cry, and give you an insightful look into adult relationships and love. Running from February 22nd – March 2nd, 2019 over ten shows at the Robinson Memorial Theatre. Online ticket sales close three hours before the event's start time. If you would like to check seating availability, please email mmt.tickets@gmail.com immediately and we will try to accommodate your request. Please note we cannot guarantee any extra availability once ticket sales close for a specific show. For more information check out our FAQ page! Please note: If you are a student, please show your student ID when you arrive at the show. Tickets are non-refundable.